Bumping was back at Indianapolis Motor Speedway and everyone was thrilled. Until people actually got bumped. Many people are OK with that. A rule is a rule and 33 cars is the rule , so hooray for tradition! What a victory for the purists, who harken back to those wonderful days when Al Unser Jr., Emerson Fittipaldi or Bobby Rahal had to go home. If it can happen to Roger Penske, it can happen to anyone, right? Bumping makes for a dramatic day of television. It’s a ride that can be as wild as the race itself, and it is gut-wrenching agony to those teams on the bubble as the clock winds down on their chances to make the show. So everyone got to see Mann cry when the only thing she works for 365 days a year slipped away. They got to applaud Hinchcliffe stoically accepting that his team picked a bad day to have a bad day, then applaud again when he insisted he honor tradition and wasn’t comfortable asking another driver – a part-timer, or a one-off driver – to step aside on his behalf. What a great moment in Indy 500 lore! What a short-sighted and stupid win for tradition. This isn’t 1982 when 47 drivers didn’t make the race. This is 2018 and motorsports is big business. In an industry hanging by a thread, sending two drivers home on the biggest day of the year will have long-term ramifications for an IndyCar Series that is trying so hard to climb back into relevance. Bumping is done. The future is now going to be a race to find the first 33 drivers who can come up with the money for a seat. Oriol Servia? Check. Stefan Wilson? Check. Sage Karam? Check. Even Danica Patrick, in her final race? Check. Well, next year, James Davison maybe doesn’t get a chance to say he’s the 35th car headed to Indy. What sponsor wants to sign a check, hand it over to the last guy at the party, and cross their fingers they get to go to the Indy 500? It’s a massive leap of faith for a sponsor. If you care only about the Indianapolis 500 – and many people do – then there is absolutely nothing wrong with Hinchcliffe and Mann missing the race. But if the lore of the 500 can be set aside for just one moment, and the big picture is revealed, Hinchcliffe and Mann missing the race is a disaster for the IndyCar Series. Arrow Electronics spends a lot of money to sponsor a Canadian driver in an American motorsports series and expects a return on its investment in Hinchcliffe. NASCAR has adopted a charter system that prevents full-time teams from missing a race because team owners can’t sell sponsorship if companies think they might be left out of the Daytona 500. Arrow willingly spends enough that it has earned the right to have a guaranteed spot for its driver, who also happens to be in the championship hunt, in the Indy 500. Missing the 500 will be disastrous for Hinchcliffe in IndyCar’s tight title race: The race is worth double points and Hinchcliffe is getting a goose egg. Honda shouldn’t be very happy, either. The manufacturer is a big backer of Hinchcliffe’s and has made him the centerpiece of a national advertising campaign – an ad that will probably air dozens of times ahead of Sunday’s race. It’s legal for Arrow or Honda or Schmidt Peterson Motorsports t o buy another driver out of the seat and swap in Hinchcliffe. But you better believe it is a seller’s market. Hinchcliffe is a commodity – he’s got crossover fame for his stint as runner-up on ”Dancing With The Stars” – and any driver even considering giving up a seat is going to seek a king’s ransom. But remember, this is 2018 and money is scarce. Whatever rate any driver is asking, the money would need to be borrowed, begged and stolen because if there was enough of it flowing through IndyCar there wouldn’t have been a three-year absence of bumping. If any Honda driver was approached and asked to give up their seat and demanded too high of a price, that’s fine, too. Conor Daly wants to be racing full-time and a strong showing in the Indy 500 is his next best chance at a ride. Jay Howard, just like Mann, put together the funding and qualified his car to race Sunday. Howard was the subject of rival team owner Chip Ganassi’s criticism at the start of the season when Ganassi felt there should be increased scrutiny on drivers who only run at Indy. Howard last year raced at Indy for the first time since 2011 and was involved in a spectacular accident with Ganassi driver Scott Dixon. 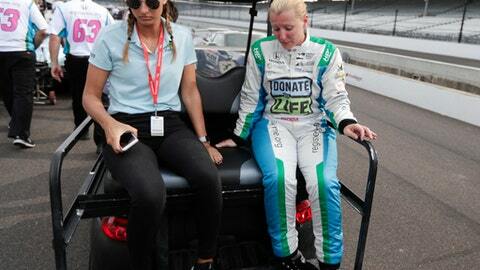 But just like Mann, who raised all the money needed to make her sixth Indy 500, Howard paid for a seat. And unlike Hinchcliffe, his Schmidt teammate, Howard qualified his car for the race. So he doesn’t have to move over for anyone. Because those are the rules. And that’s tradition. Just don’t complain when Hinchcliffe isn’t in the championship race, or Arrow scales back its hospitality or Honda doesn’t run national IndyCar commercials anymore. And don’t feel bad when Mann can’t get that last $100,000 she needs for another shot at Indy, or Karam can’t come back, or Dreyer & Reinbold Racing takes longer than expected to return to full-time racing. Somebody has to pay for people to go racing, and bumping just showed what the return on the investment can look like.